It is held that DESIRE is the main hurdle on the path to LIBERATION, because it is the root of the 5 vices – KAMA, KRODH, MOH, LOBH and AHANKAAR. It is the root cause of all suffering and destruction, creating attachments. When you don't attain what you desire or get what you don't desire it leads to suffering, anger, violence and finally destruction. “When the Jews celebrate Passover, they retell the story of their exodus from ancient Egypt to the promised land. During the Passover Seder we sing Di'anu which means “enough” – in the sense of “it would have been enough”. Had God fed us with manna and not given us the Sabbath, Dayeinu! Had God given us the Sabbath and not brought us to Mount Sinai, Dayeinu! Had God brought us to Mount Sinai and not given us the Torah, Dayeinu! Had God given us the Torah and not led us into the land of Israel, Dayeinu! What a sublime and noble sentiment – GRATITUDE! Very often the similarity between the Sindhi and Jewish community's Diaspora is cited; the only difference being that the Jewish exodus led them to their own promised land – Israel, whereas the Sindhis had to migrate as refugees to the Republic of India, post partition, and settle across the four corners of the globe, to begin life afresh. Without trying to be sententious, on this occasion of CHETICHAND let the community be GRATEFUL for all that we have received. The community has carved a niche for itself in all sectors and become a force to be reckoned with, without ever using violence or destruction, to fulfil their desires. 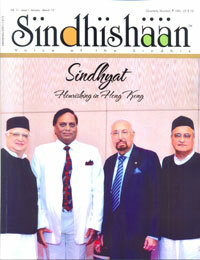 Sindhis have converted “desire” from being the source of destruction to becoming the source of “creation”. So let us renew our pledge to use our desire for purposes of creativity, innovation, and the general wellbeing of all mankind. May our only vice be AHANKAR – PROUD TO BE SINDHIS!